This topic contains 0 replies, has 1 voice, and was last updated by Laam 5 months, 3 weeks ago. 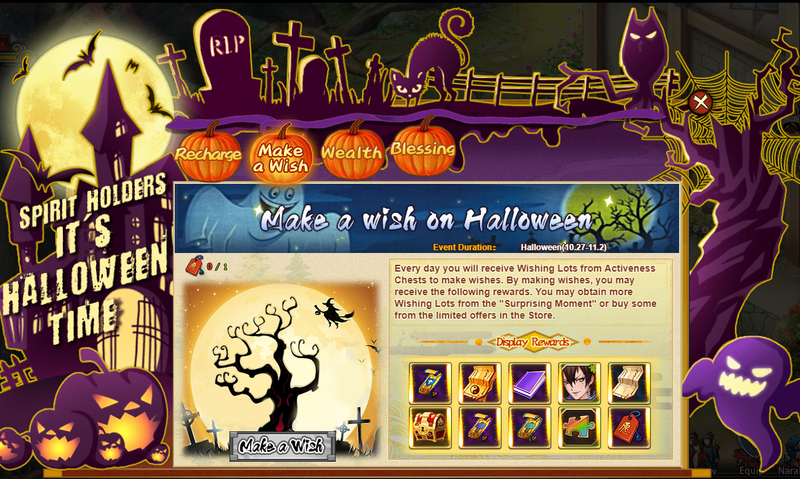 From this guide you will learn more about special Halloween events. Read further and get prepared for exciting seasonal adventures! Special Halloween events lasts for 5–6 days. There’re two activities in 2018 — «Happy Haloween» and «Festival Hotspot». There’re 4 different ways to get a special reward. 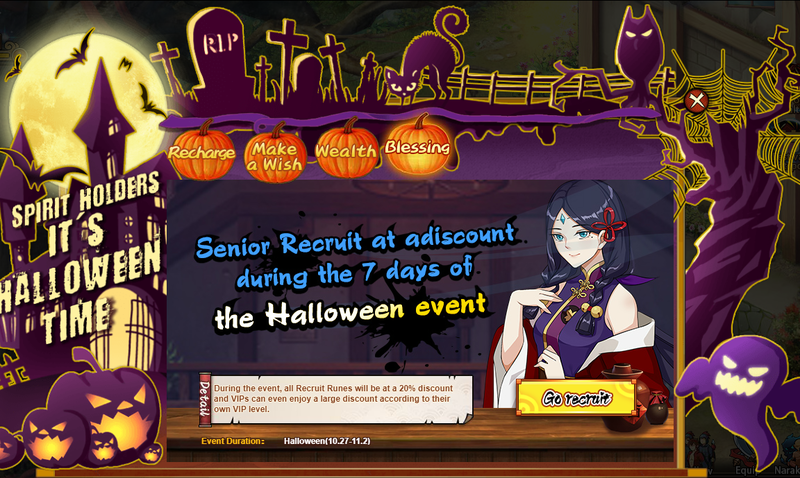 Click «Happy Halloween» button to open event window. Just purchase some Ingots and earn excellent reward! 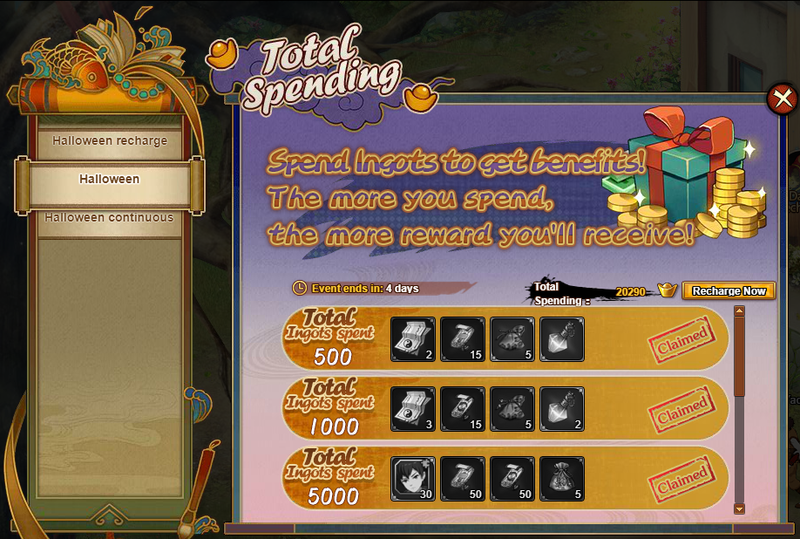 The more Ingots you purchase, the more gifts you will receive. 50000 ingots — Lv.8 Gem Bag x9, Baptism Evolution Token x10, Refining Token x1000, Talisman Skill Book x400. Bring the Wishing lots and get your reward. 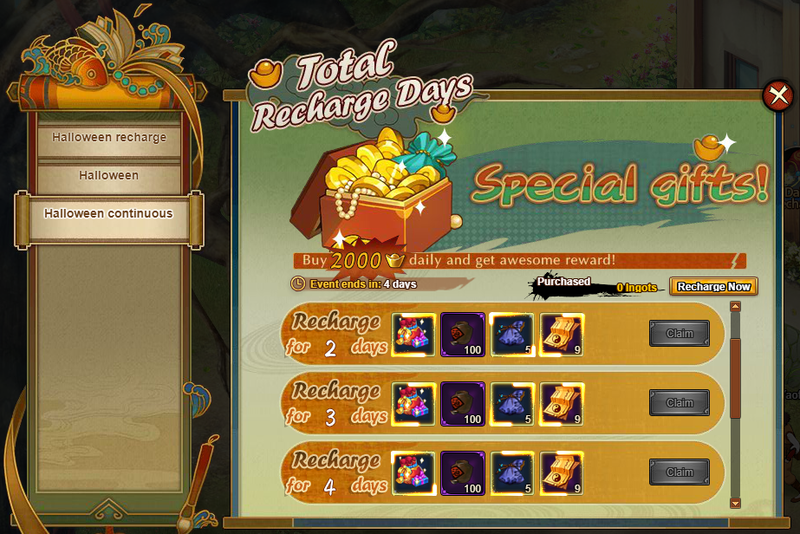 You can obtain lots by opening the daily Activiness chest, taking part in Surprising momen special and just buy some in the store. Baptism Protection Token , Senior Summoning Amulet, Talisman Skill Book, Sun Zhantian Fragment, Scroll of Teleportation, Talisman materials box, Batism Evolution Token, Refining Token, Elemental Fragment, Wishing Lot. You’re just making your daily routine in dungeons but with double rate for materials! For Halloween season exclusively! Just start exploring any dungeon and check it! Senior recruit’s never been so cheap! For Halloween season you get a 20% or more discount! Now you get a chance to finally recruit a warrior of your dream! 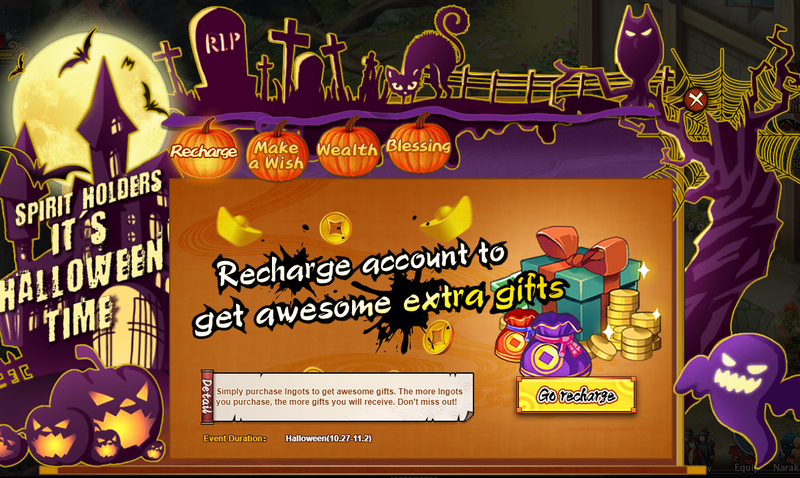 You can reach even more rewards for Halloween! Tap Festival Hotspot icon and open an additional menu. Here you can reach reward for spending ingots. The more currency you spent the more gifts you receive. 70000 ingots — Sun Zhantian Fragment x100, Refining Token x500, Lv.6 Gem Bag x27. Hero upgrade pack, Sangluo Wine x100, Lv.3 Gem Bag x5, Senior Summoning Amulet x9. See you on Rakshasa street!